The Bureau of Mines estimated the methane content of a coal, which depends primarily upon rank and pressure, from the adsorption equation V = kPn, where k and n are constants related to rank. By incorporating corrections for moisture, ash, and temperature, and estimating pressure and temperature as a function of depth, the methane content of coal in place can be estimated. Values calculated with this equation generally are in reasonable agreement with direct determinations. By assuming a standard moisture and ash content, and using the hydrostatic head to estimate pressure, a graph of rank and depth versus gas content was constructed. 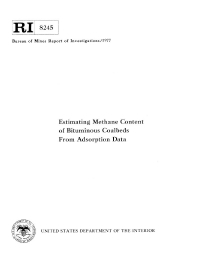 Although estimated values were consistently high for several high-volatile bituminous coals from an area where the pressure is known to be less than hydrostatic, the estimated methane content for most coals shows reasonable agreement with values determined by the direct method. Methane Gas Content of the Mary Lee Group of Coalbeds, Jefferson, Tuscaloosa, and Walker Counties, Ala.